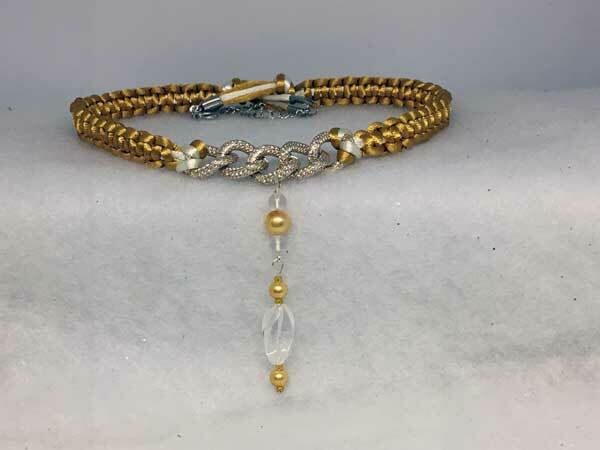 This corded necklace is made using mostly satinique cording in gold and white along with a section of gold textured chain in the center. The length can vary from about 18 to 21 inches with a center jeweled piece that adds over 2.5 inches. It starts with a large, gold pearl round surrounded by two small round rock quartz. Hanging from this is a large beautiful twisted rock quartz surrounded by gold pearl rounds and gold seeds.